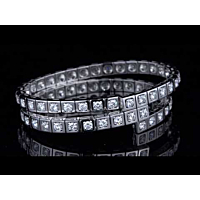 From Cartier, a full diamond tennis bracelet shimmers from a white gold foundation; Chic and stately. White gold and 9.9 carats of brilliant cut, VS quality diamonds glint as delicate and subtle movements of the wrist display sensuality and elegance. As authentic Cartier quality and design remains unmatched, this bracelet transcends the everyday, making the ordinary exquisite.